even Bill Gates ... in a private rail car! 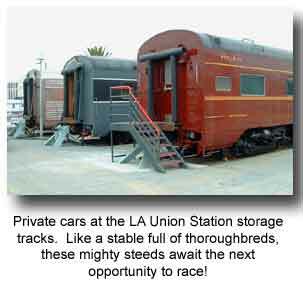 Yes ... you can charter your very own private railcar or even a "pocket streamliner" made up of several cars! Unforgettable events that will be remembered long after they're over. 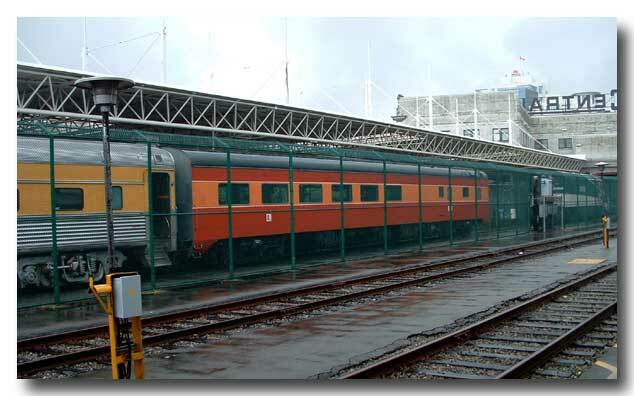 Passenger trains may no longer be in vogue for regular travel, but they are, remarkably, still part of our "national sub-conciseness". Americans just won't let the passenger train die. This is precisely why private car events are your hot ticket to success ... they are new and unique all over again! 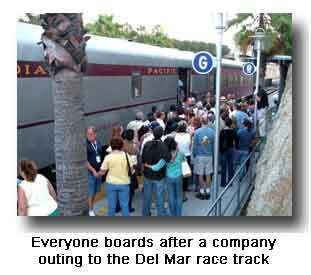 "Nobody has ridden a train in years!" 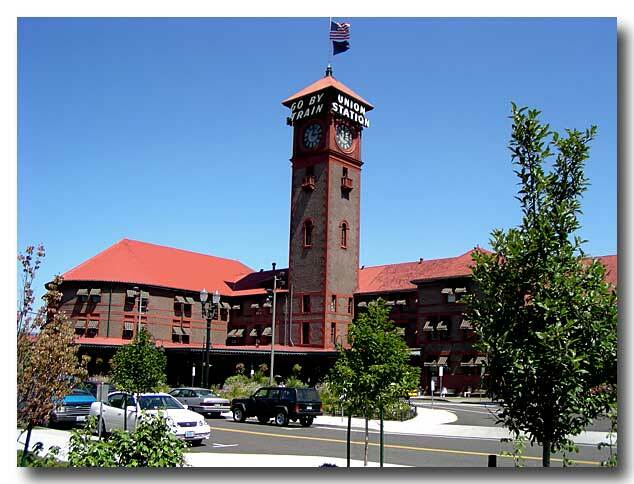 Imagine sending out your invitations with instructions to meet at such and such train station ... your guests will go wild with curiosity and excitement. 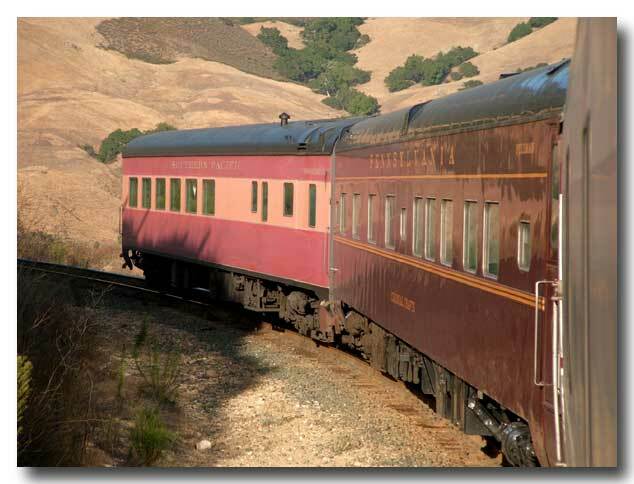 Whether you need a special conveyance for two or two hundred, we have the vintage railcars to meet your needs ... are you ready for departure? 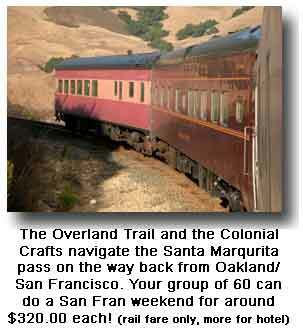 A charter on board the Overland Trail offers a unique opportunity to excite your guests with an event they'll never forget. 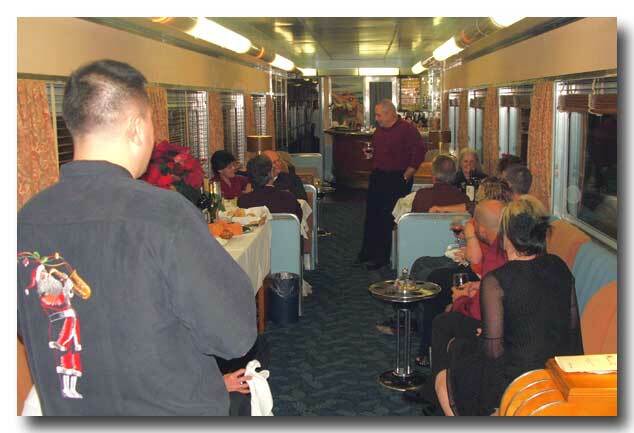 Our traditionally attired crew, complete with chef, bartender and servers will cater to your every need, and by operating with additional private railcars, such as the Pacific Sands or Colonial Crafts, the Overland Trail can offer the luxury of fabulous meals and overnight or multi-night trips to exciting destinations around the country. 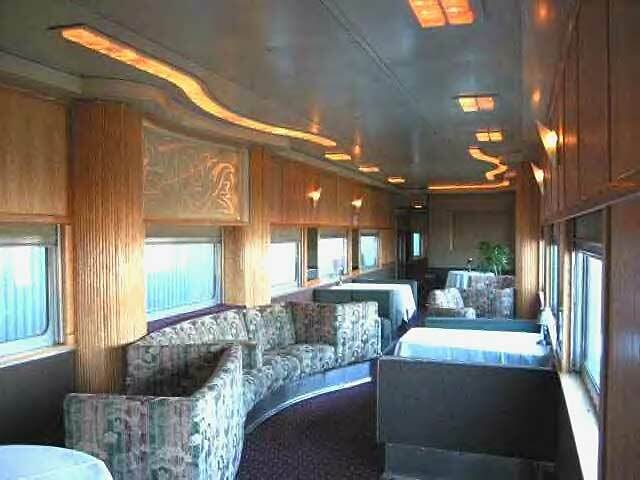 Or perhaps offer gorgeous panoramic views from a glass-topped dome car, or even dancing with a live band on board! The Overland Trail and the Pacific Sands parked in Vancouver, Canada. Have a group or family of 20? Want to enjoy total relaxation and see the country? Let us know where you would like to go! 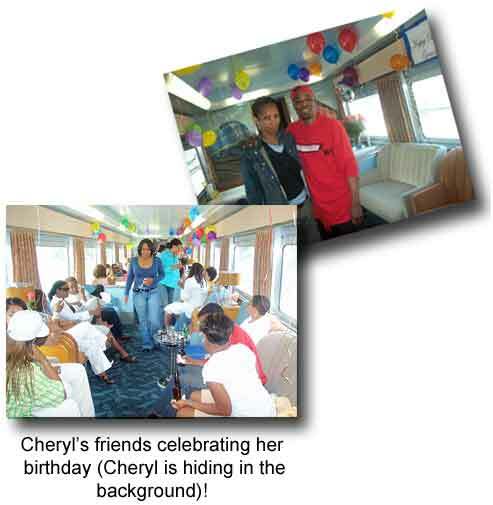 All examples are round trip and include food and beverage on the train. 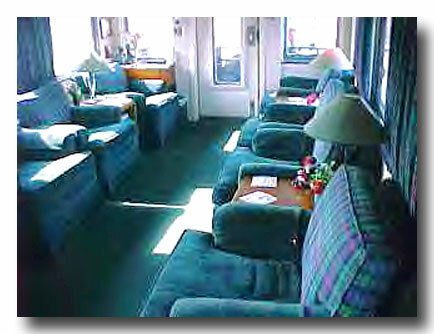 Overnight travel includes traditional railroad sleeping space. All fares are for example only, and may change at any time. The Overland Trail becomes your deluxe Art Deco setting for your holiday party, and it all starts right in down town at Union Station. 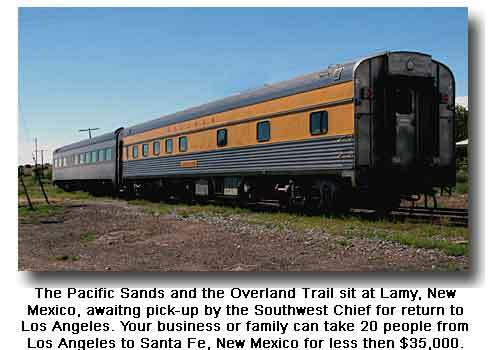 There are two ways to enjoy the luxurious ambiance of the Overland Trail ... live behind an actual train, or stationary at the private railcar tracks at Union Station. Either way, we can rent you "just the car" or provide everything ... food, beverage, etc., for a wonderful time. 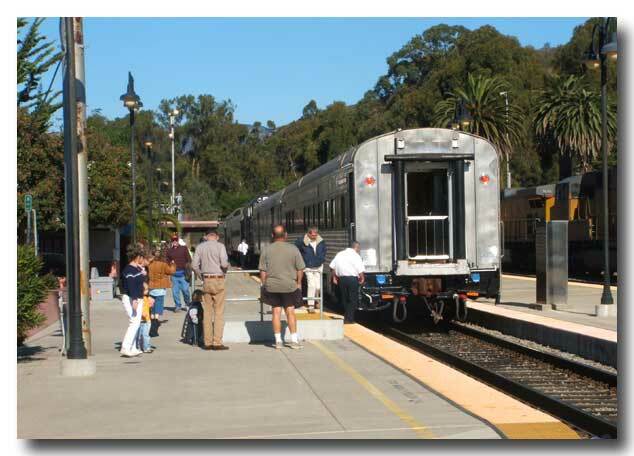 Schedule a live rail event between Los Angeles and San Diego or Los Angeles and Santa Barbara. Your company staff (plus guests, venders, clients, etc.) 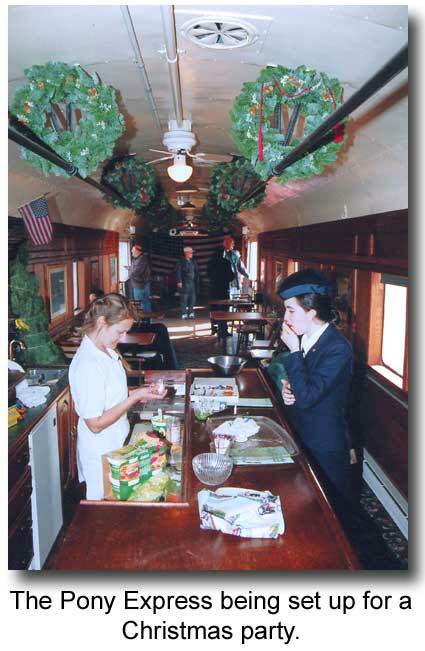 will be talking for years about the grand time had by all aboard your "Holiday Express"! 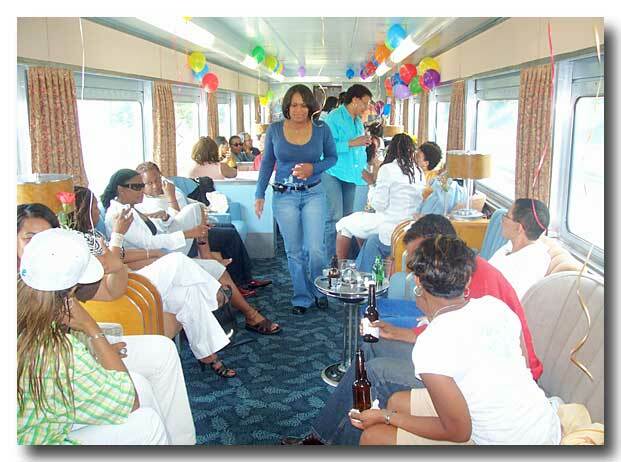 To begin with, nothing compares to the romance, mystery and adventure long associated with deluxe rail travel...but add in the festive nature of the holidays and your guests will have their senses overwhelmed. 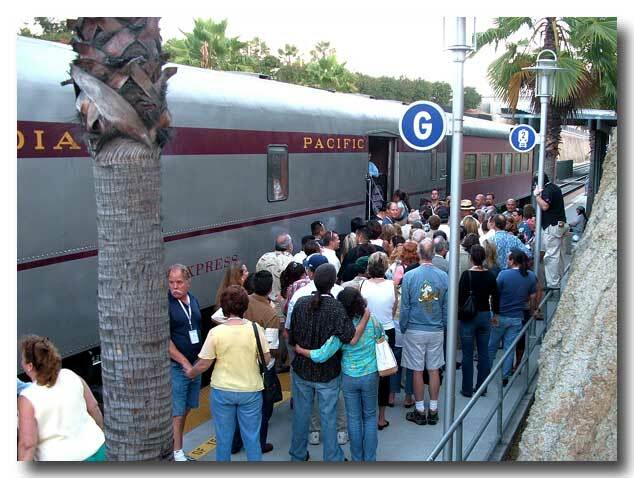 Live rail trips between LA and San Diego will entertain your guest list for a minimum of 6 hours ... others schedules available ... up to a full day's worth of entertainment. Just a few hours needed in Downtown LA? 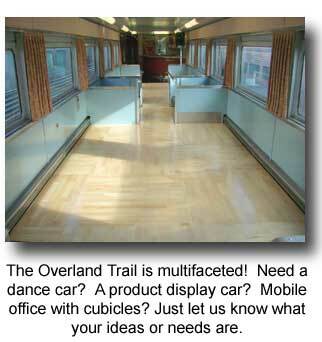 The Overland Trail is available for stationary parties right at Union Station. 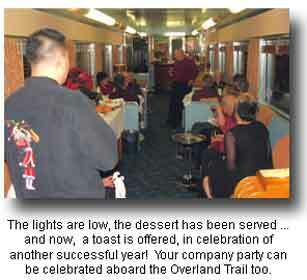 You may not feel movement under your feet, but for decor and ambiance, the Overland Trail beats a hotel banquet hall hands down (not to mention the company conference room). 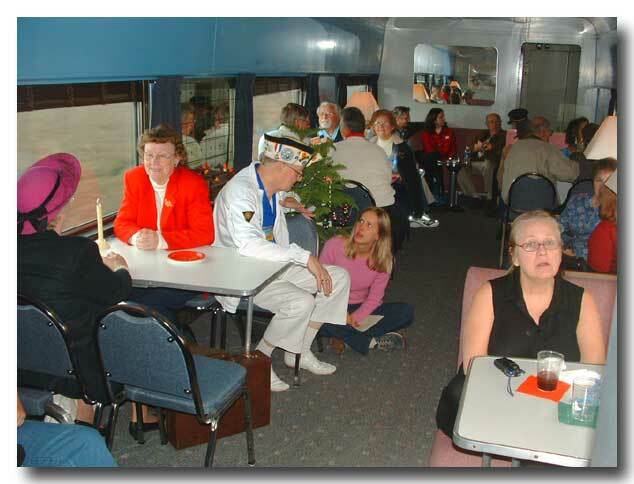 If your company event has been getting a little bland lately, please contact us for a unique venue that, we promise ... has excellent entertrainment value. Some sample costs for a San Diego/Santa Barbara adventure! 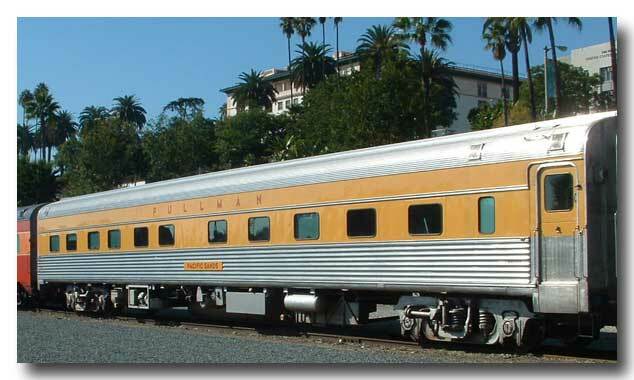 Live rail journey between LA and San Diego with seats for up to 39 and includes freshly prepared food (buffet and hors d' oeuvre service), beverages (including coffee, tea, soda, milk, beer, and wine service), traditionally attired crew, holiday decorations and recorded music, linens and fresh flowers -- costs $4900.00 (Santa Barbara is $4,499.00). Add $500.00 for full bar service (up to 20 people). Increase total capacity to 80 by adding the Amber Trail (available fall of 09) for only $2900 additional. 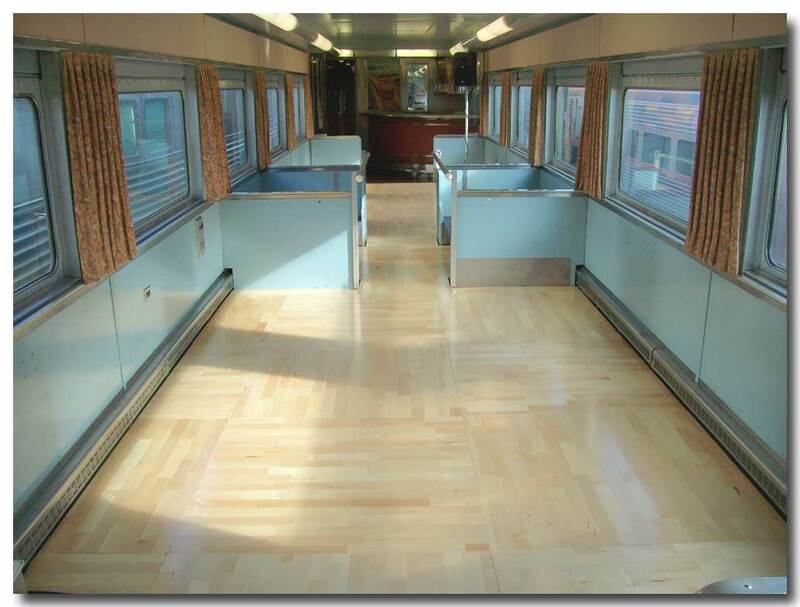 The Amber Trail (coming soon) a 44 seat chair car with leg room that "won't quit" ... a very relaxed vintage interior, 22 windows in the main chair compartment -- a very comfortable car. 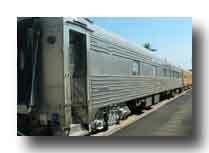 We can provide similar (but lessor) service as above for 44 guests between LA and San Diego for only $3900.00. That includes snacks (cheese and crackers, vegetable plate, dips and chips), beverages (coffee, soda, beer and wine), crew and seasonal decorations. 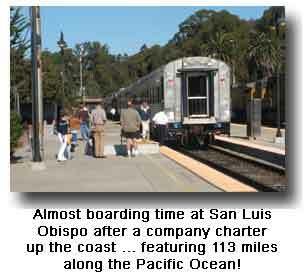 Sample menu that would be included in the base price for a Los Angeles to San Diego charter. Food is prepared on board with fresh, high quality ingredients. Southwest fritata with chiles, green onions and cheese ~ sliced chicken sausages ~ bagels, lox and cream cheese ~ muffins ~ fresh fruit for breakfast of brunch. Sandwich bar with several meats, cheeses, breads plus salad and dessert. Steak filet salad with jicama, red & yellow peppers, mushrooms, avocado and red onions; balsamic vinaigrette / ranch / blue cheese dressings and rolls for the late afternoon or evening meal. We also offer an hor d"oeuvre/snack menu if you plan on a restaruant meal in San Diego. 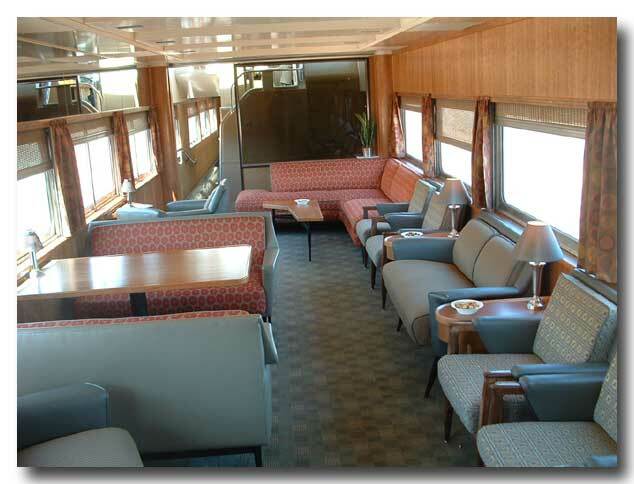 We offer several different options for food service on board the Overland Trail ... please inquire. Extra large group? Not a problem! cars to suit your needs. Once in a Life Time Family Vacation! For the large family group, the Overland Trail and the Pacific Sands team up to provide an incredible opportunity ... gather up the extended family (there are 20 beds in the Sands ... that means Mother-in-Law has to come too!) and head off into the sunset onboard your private mini train. A wonderful chance for some real family bonding as your kin enjoy personalized service and adventure ... as the miles tick off and high plains turn to dense forest ... see America at SEE LEVEL! 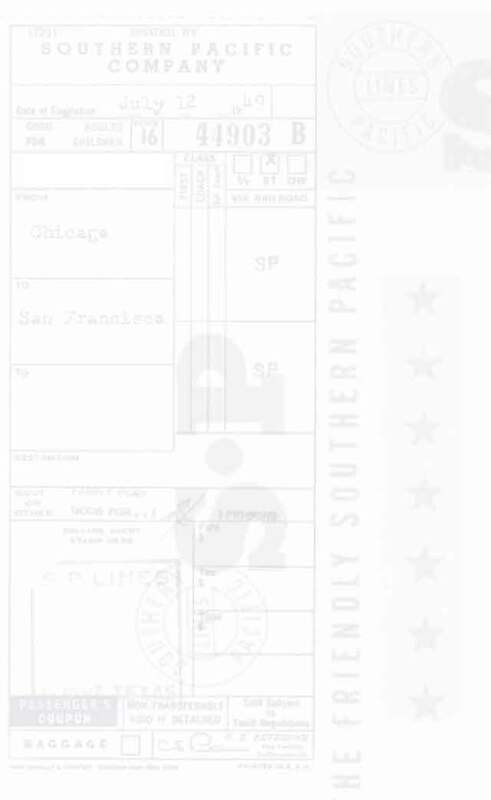 We can plan a journey to a single destination or multiple cities. Do you need some reasons for planning such a venture? A time to really get to know Uncle Joe. Aunt Sue has been wanting to teach Becky how to knit for years. When IS the last time I enjoyed a chess game with cousin Jeff? Grandma and Grandpa are getting up in years ... and the kids hardly get to visit anymore. 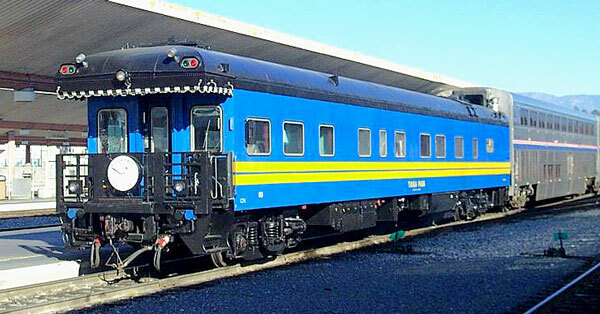 Book a "business car" which is completely self contained for 4 or 5 people (plus crew) or a "sleeper lounge" which will sleep 7 to 10 (plus crew). Personal attention, great food and beverage ... your home away from home as you travel the country at SEE LEVEL ... come on, take a well deserved BREAK! 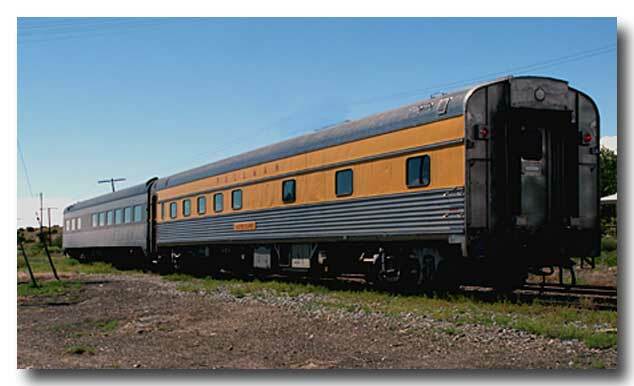 Although historically restored to capture the classic style of a bye-gone era, the Overland Trail is fully equipped with all the modern safety systems present in even the newest of any railroad's fleet. 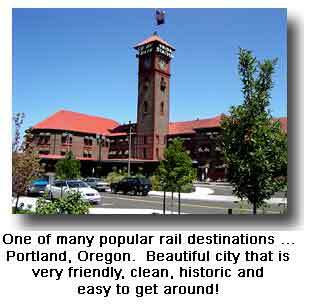 The Overland Trail is currently certified for operation at speeds of up to 110mph, and can travel to any city in the US currently served by Amtrak. Bill and Debbie thank you for visiting. 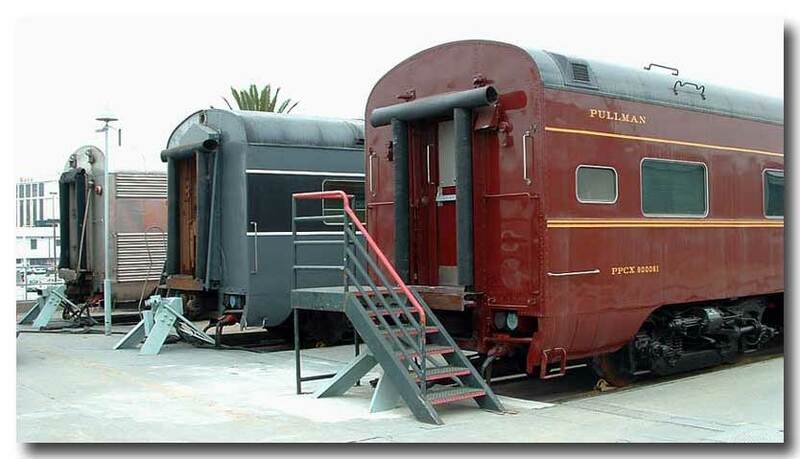 The restoration of the rail cars have been a labor of love for decades (OK, it's only been 18 years) ... for their personal enjoyment, their supportive patrons ... and for generations to come. They want to remember the Streamliner Era and the kinder, gentler era of the 40s and 50s. If you appreciate their efforts, please share their endeavors with your friends and loved ones ... they rely on YOUR 'word of mouth' endorsement!